In December of 1844 William Benitz was granted 5 sitios de ganado mayor in the northern Sacramento valley by Manuel Micheltorena, Governor of Alta California (1842-1845). 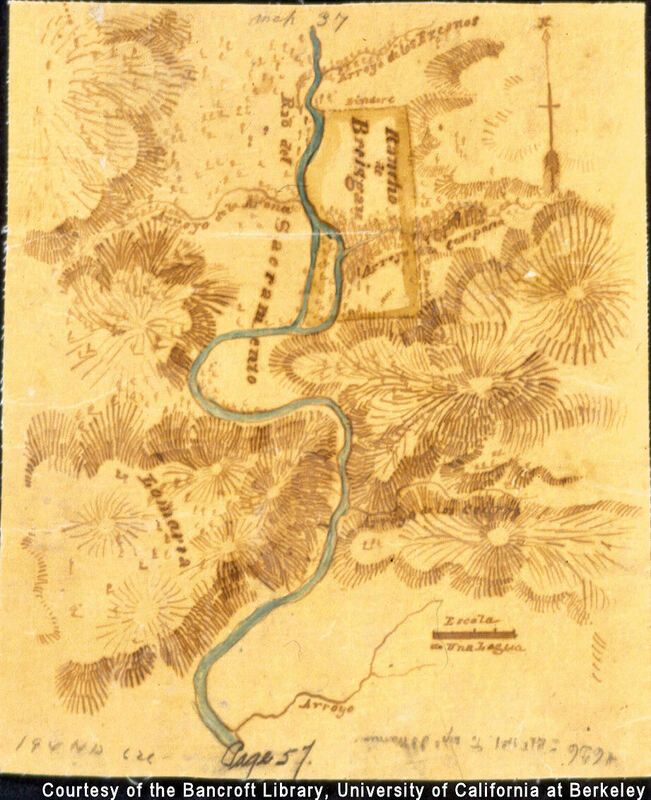 On the diseño drawn by William (see below), he named the property Rancho de Breisgau. John Sutter suggested Breisgau — William’s home shire in the Grand Duchy of Baden (Germany). In letters to his brother Thad in Endingen, William calls it New Breisgau — and that is how we refer to it. In the US Land Court records, it is referred to as Breisgan. Today it is known as Rancho Bresgau. To recruit an army in his 1844 campaign against a group of rebellious Californians, Manuel Micheltorena offered all who served with him, including those of foreign birth, the right to own the land which they had been permitted to occupy. In June of 1844 William filed a petition for New Breisgau in return for having served in the Mexican army without pay since 1840. It is not known in what capacity he served prior to 1844, but during 1844 he served 6-8 months as a lieutenant in the Sacramento Riflemen, captained by John Sutter. In July of 1844 Micheltorena granted William the right to occupy the land, but would not confirm ownership to him until he had an opportunity to visit it. However (per Ernest Rufus, the other lieutenant in the Sacramento Riflemen), some months later in San Luis Obispo, William was in command of a party of riflemen which brought in a prisoner by the name of Miguel Abila. This so pleased Micheltorena he informed William the land was immediately confirmed to him. The grant was later included in a general grant made on December 22, 1844. 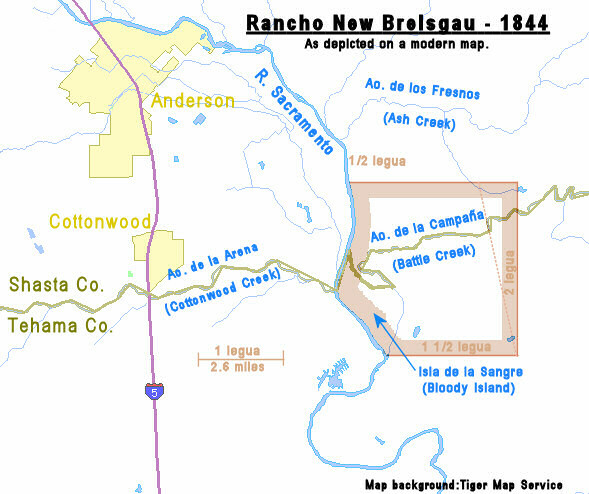 Rancho New Breisgau lay along the east side of the Sacramento River, its northern limit 1 - 1.5 miles south of Ash Creek, approximately where today there is a road bridge across the Sacramento; its southern limit was the south tip of Bloody Island, where Battle Creek joins the Sacramento. 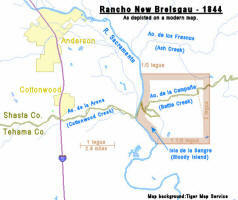 In 1844 the entire area, including the rancho, was in Shasta county. In 1856 Shasta was split along Battle Creek; its southern portion became Tehama county and Rancho New Bresigau wound up partly in each. The entire limit along the Sacramento can only have been two leagues in length, including Bloody Island. 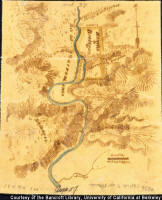 William’s diseño shows no other rivers in the vicinity and we know (from the estimates he made of Rancho Hermann) that he overestimated distances, so we believe the Arroyo de los Fresnos is correctly labelled and that it is not the more northerly Bear Creek or Cow Creek. The grant was for 5 Spanish square leagues (sitios de ganado mayor), about 21,700 acres or 8,800 hectares. However, it is clear from the diseño (and simple math) that it was much smaller, its size dependant on how its east limit was defined. Both the diseño and the testimony agree on the west and south limits: beginning at the south end of Bloody Island, the west limit went two leagues north along the east bank of the Sacramento, and the south limit went directly east one and a half (1½) leagues. If the east limit paralleled the Sacramento as in the diseño, then the rancho encompassed 3 and a bit leagues (2 by 1½ + the bulge of Bloody Island); if the east limit went straight north as in the court testimony, then the rancho was wider along its north limit by about a half (½) league so that it encompassed at most 4 leagues. In modern terms, its true size was somewhere between 13,000 and 17,400 acres, or 5,200 and 7,000 hectares. On 8 June, 1849, Ernest Rufus sold his 3 leagues of Herman Rancho to William Benitz and Charles Meyer for $1,000 (in above menu, see Rancho Herman), which on its own appears to be highly undervalued. However, when combined with the exchange of ownership as described by Kraft and Woodrum, its price is more reasonable. In 1854, four years later, Herman Rancho was sold for $26,500; in 1856, Ernest Rufus sold his doubtful claim to all 5 (!) leagues of Rancho New Breisgau for $5,000, which suggests Rufus had previously obtained William’s remaining share. We have no record of how William disposed of his share. Following the US-Mexican war of 1846-1848 Alta California became part of the US. In 1853 the Board of Land Commissioners ruled that William held insufficient proof of title — as a result, the rancho was not patented. Though his appeal in 1855 to the US Supreme Court went in his favor, per his letters, he regained only 7,500 acres (3,000 ha.) at a cost of $12,000 in legal expenses. Coincidently, the 7,500 acres are approximately half the true acreage, which would be William’s share given that Rufus owned the other half — disregarding the squatters claims.